SmartGo Books has been quietly adding more books over the last months, publisher Anders Kierulf reports. 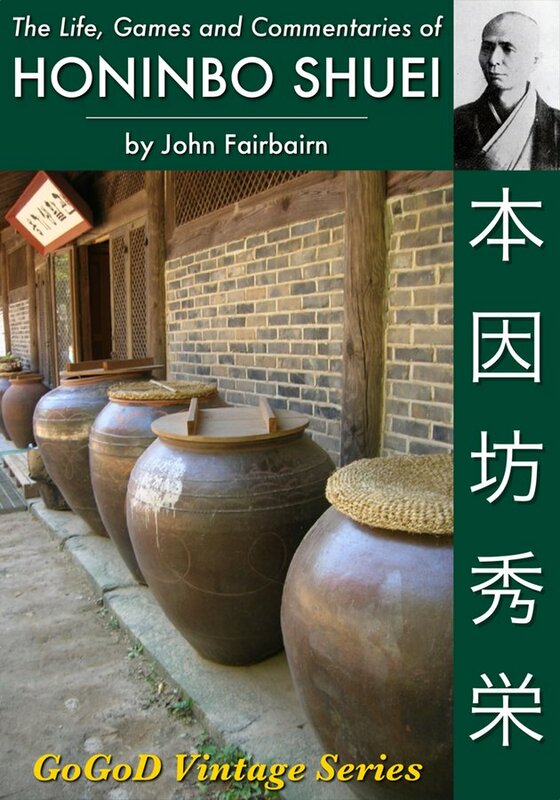 John Fairbairn’s “The Life, Games and Commentaries of Honinbo Shuei” is one of three more books added recently, bringing the total to 61. “Schwarz am Zug: Das Go-Übungsbuch” by Gunnar Dickfeld is SmartGo Books’ first book in German, containing 131 go problems for beginners. “As with our other multi-lingual books (“Patterns of the Sanrensei” in Japanese and “How NOT to Play Go” in Spanish),” notes Kierulf, “English is always an option.” Click here for more information on books by Brett und Stein Verlag. “The Workshop Lectures, vol. 5” by Yilun Yang 7P looks at choosing areas in the opening, handling unusual opening moves, and protecting positions. “As always, Mr. Yang emphasizes the importance of understanding general principles rather than memorizing particular patterns,” says Kierulf. SmartGo Books is a free app for iPad, iPhone, and iPod touch, with books available through in-app purchase. GoEye, the latest go-related app for iOS 5.0+ iPhones, helps you organize, build and enjoy your sgf collection, but offers no content of its own. I’m pretty happy with the sgf readers I’ve written about before, but GoEye does have a couple of unique functions. For commented games, the PDF creator turns the SGF into a PDF file with numbered stones on a series of diagrams, and the accompanying comments at the bottom at the bottom of each page. So for instance, if the first comment appears at move 5, the PDF will show a game record with moves 1-5 and the comment; if the second comment is at move 17, the next record will show move 6-17; etc. Explanatory diagrams also appear, and the pages curl nicely as you “turn” them. There’s an “Alert” function that tells you when you get to the next comment. The game info pops up, pushing the board down, a move that is sure to get your attention; you can swipe it back into place, but I would prefer an alert that doesn’t disturb the status quo. 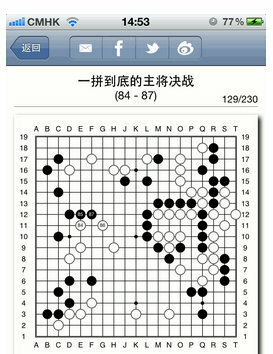 I was unable to load large files, such as Kogo’s Joseki Dictionary. I told the developer, who then released an update he claims fixed this bug, but I still can’t get such a large file to load. A link with Go4go.net gives you access to recent pro game records, or for €9.99 purchase the entire 33,000 game archive; but at present you can’t search Go4Go while within GoEye. They also plan to integrate seamlessly with others sites such as GoBase, but for now it’s easy enough to collect the files you want directly, then use the reader of your choice to view them. GoEye also contains an “image recognition” feature meant to read images of go games and transform them into sgfs. I found it somewhat tricky and picky. You can use it for instance when players post positions on GoDiscussions.com and ask for comments, but it doesn’t work well with photos. GoEye is integrated with Facebook and Sina Weibo, a popular Chinese microblogging site. GoEye provides users with first-rate graphics and a couple of nice features, but falls short of its self-proclaimed status as “the best iOS app for go.” If you spend a lot of time looking at SGF files, and you’re not happy with any of the readers that are out there, maybe it’s worth $11.99 to give GoEye a try; unfortunately there is no free trial offer. But if you’re shopping for software that helps you study, consider other apps that offer original content and additional features.